Monday, 31 Aug 09, 2:46 pm PDT – CHARA Array operator PJ Goldfinger reported that at about 2:00 pm she monitored an LA County Sheriffs Department transmission advising a pullout from Red Box, the major staging area near the mountain. I just spoke with Sherry Roman, Public Affairs Officer of the Angeles National Forest. She could give no updates as to the status of the fire in the Mount Wilson vicinity except that the USFS still considers that passage of fire across Mount Wilson is imminent and will be fought aerially rather than with ground personnel. Once the fire is through the area, they can assess the damage by air after the event before they can send in ground personnel. She also confirmed what PJ’s monitoring implied, that firefighters have been removed from Red Box. This roller coaster has taken a dip downward. —Mt. Wilson Observatory. 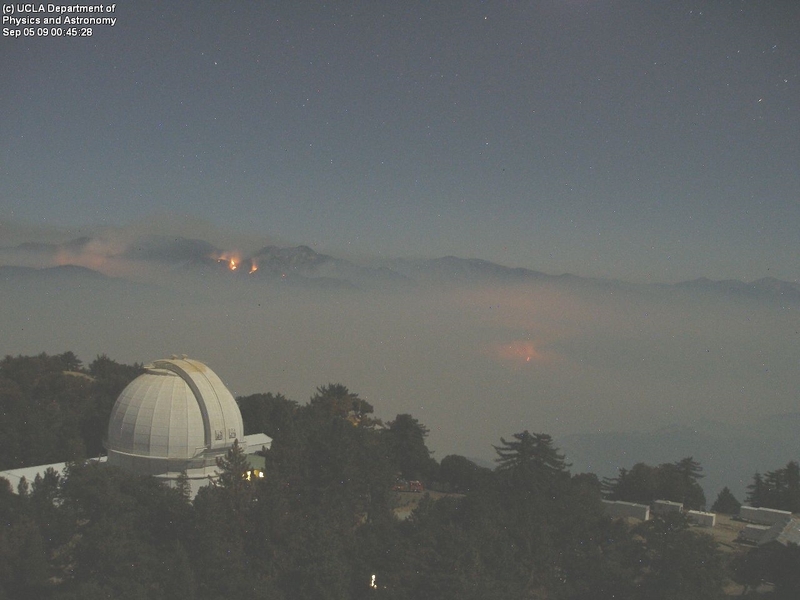 August 31st, 10:00 PDT: Well, last night was a rather dramatic night for the Mount Wilson Observatory. During the seemingly relentless charge of flames pushing dangerously close to the summit, news came in that it was very likely the Station Fire would arrive at the observatory some time last night. However, due to the brave efforts of fire crews who camped out on Mt. Wilson through the night, the observatory and telecommunication masts look like they’ve been saved, for now. 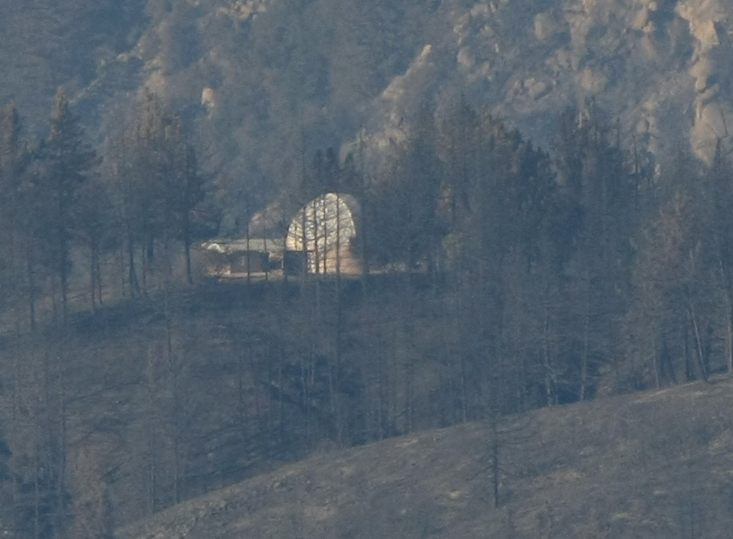 “At this point, I don’t think [the observatory] suffered any serious damage. We’ll probably get some flare-ups or threatening flame activity, but we don’t think it’s going to be a major problem,” Inspector Edward Osorio of the Los Angeles County Fire Department said this morning. Aggressive brush clearance and fire retardant appear to have helped, slowing the advance of the flames. However, the observatory and critical communications equipment are not out of the woods quite yet. The threat of flare-ups could still pose an issue. Another cause for concern is the fact that fire crews have been ordered away from the observatory earlier this morning, possibly to relocate north of the fire, the direction it appears to be heading. Monday, 31 Aug 09, 7:50 am PDT – At 6:25 this morning, fire crews were instructed to withdraw from Mount Wilson. Larry Webster and Dave Jurasevich left the mountain with them. I have just spoken with Larry and Dave when they reached the bottom of the Angeles Crest Hwy in La Canada, and they report minimal fire activity in the immediate vicinity of Mount Wilson. It is not clear why the withdrawal decision was made nor whether or not the fire crews will return. Those fire fighters joined other crews deployed at the Red Box turnoff to Mount Wilson, five miles from the Observatory. So, they are still within close proximity for redeployment. Thus, the good news is that the fire in the Observatory’s vicinity seems to have diminished. The bad news is that there are no fire fighters presently on the scene. —Mt. Wilson Observatory. The Station Fire has claimed the lives of two fire fighters and caused nearly $8 million of damage. The fire is now 85,000 acres in size and continuing to spread in hot, dry conditions. Here in the San Fernando Valley, west of the Station Fire, the air is full with the smell of smoke and numerous poor air quality warnings have been issued. Sunday, August 30th, 20:30 PDT: According to the Mt. 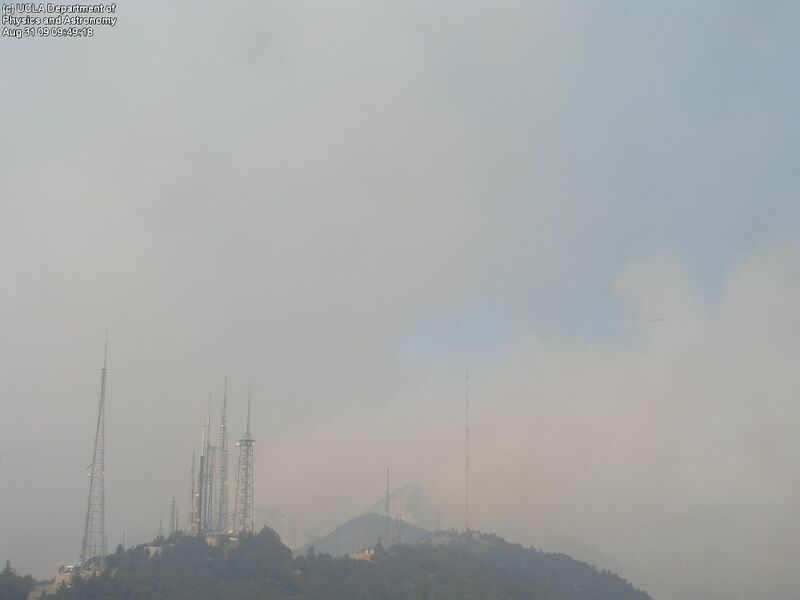 Wilson Observatory fire updates, fire crews have decided to remain at the summit of Mt. Wilson to fight the Station Fire blaze overnight. There were concerns this evening that the conditions would be too treacherous for the fire fighters to remain behind, but it would appear this has changed. Unfortunately, in another location, two fire fighters have tragically lost their lives fighting a blaze in Acton. According to reports from @CalFireNews and the LA Times the fire fighters were involved in an accident where their vehicle apparently rolled over a mountainside. The accident happened during a period of intense fire fighting. This is a horrific reminder that hundreds of brave men and women are currently out there battling against hellish heat and poisonous air. My thoughts are with the lost fire fighters families and the fire fighters that continue to push on through the night atop Mt. Wilson and the areas hit hard by the Station Fire. August 29th: As the fires rage in Southern California, the “Station Fire” continues to burn unnervingly close to the famous Mount Wilson Observatory, about 50 miles east from my location. 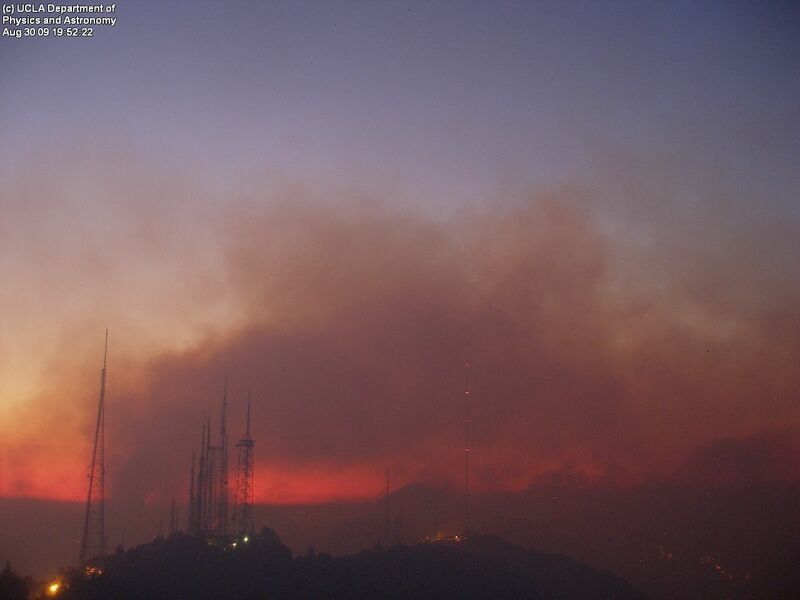 The above image was captured at 8:29pm (PST) tonight from the observatory’s 150-foot Solar Tower webcam (called the “Towercam”), and it’s pretty obvious how close the fire is. Mount Wilson isn’t just important for the observatory, it is also home to telecommunication masts that are a lifeline for emergency services. “If Mount Wilson goes out, this news conference is done, because we won’t have any telecommunications,” Deputy Los Angeles County Fire Chief Jim Powers said in a press conference this morning. Update (August 30th, 19:40 PST): Things are looking a little grim for Mt. Wilson. 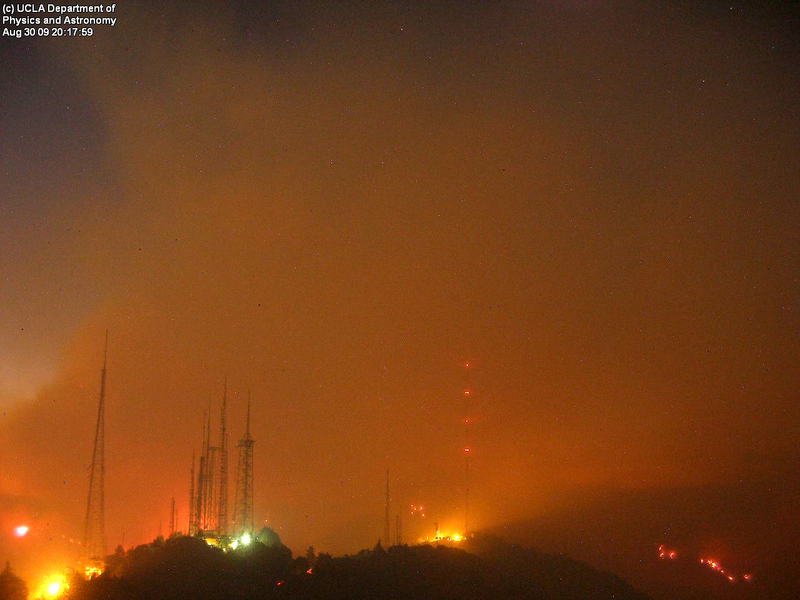 A couple of hours ago, the LA Times reported that the Station Fire was expected to reach the summit of Mt. Wilson in 2-4 hours. The worst news is, that due to a lack of escape routes at the observatory, fire crews will have to abandon the site should the fire get too close. 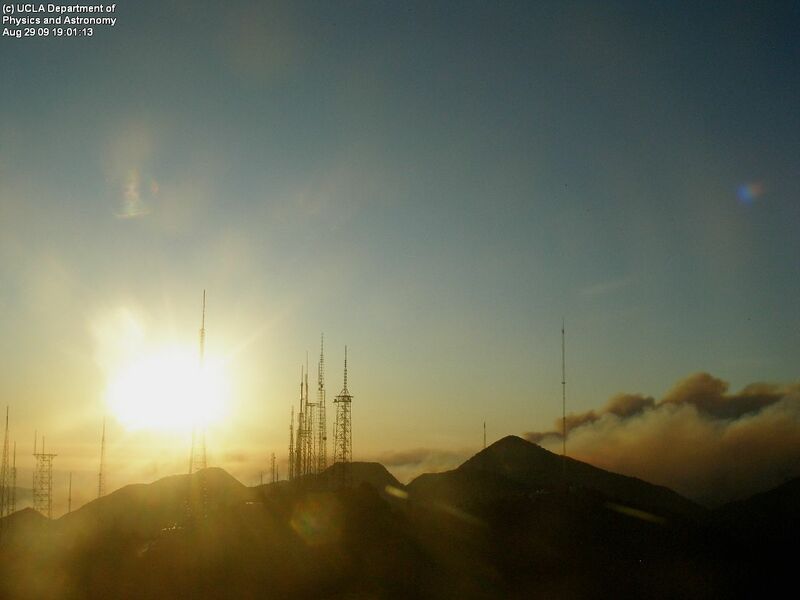 At 17:42 PST, the fire was within 2 miles of the summit and closing. Fire crews have been working on removing brush from the observatory buildings, structures that cover many acres. I was driving through Woodland Hills today, and the view from here was ominous. The smoke is thick, and a huge cumulus cloud was rising high in the atmosphere. At one point, the scene looked like a volcano from a distance. The LA Times has released this article in the last hour. Our reports on site are not presently so dire, but the “fog of war” certainly exists in a situation like this. Every preparation is being made for this scenario, and it may indeed yet happen. I remain optimistic for now. Thanks to Mike Brown (@plutokiller) for the link to the Towercam.